Next time you hear or read about the hysteria of climate change and the shakedown/scam of carbon trading, remember this book written in 1841….None of this stuff is new. Previous generations have been there before and got stung and cleaned out!!! This brief review gives the background of the book. 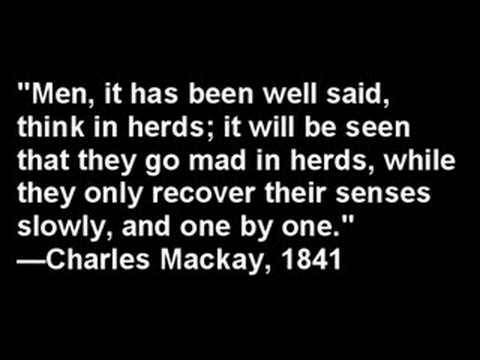 “..Charles Mackay’s highly recommended Extraordinary Popular Delusions And The Madness Of Crowds was first published in 1841 and studies the psychology of crowds and mass mania throughout…… history. Mackay included accounts of classic scams, grand-scale madness, and deceptions. Some of these include the Mississippi scheme that swept France in 1720, the South Sea bubble that ruined thousands in England at the same time, and the tulip mania of Holland when fortunes were made and lost on single tulip bulbs.